Are you confused about the different types of frosting and when to use them? Do you have questions about which frosting will work best for your cake or cupcakes? Are you tired of being confused when cake decorators on TV talk about ganache this, SMBC that, French buttercream here, American buttercream there? Are you ready? This is a LONG post, very informative, you might need to get comfy. Do you call it Frosting or Icing? Do you even call it frosting? Some people call it icing… I guess it doesn’t matter to me. Really, I have no pet peeves about people calling it one or the other. I do say “frost the cake” instead of “ice the cake.” Perhaps, I consider icing the thinner, glaze that is drizzled or poured over desserts. Maybe icing has to dry to the touch and not be sticky? 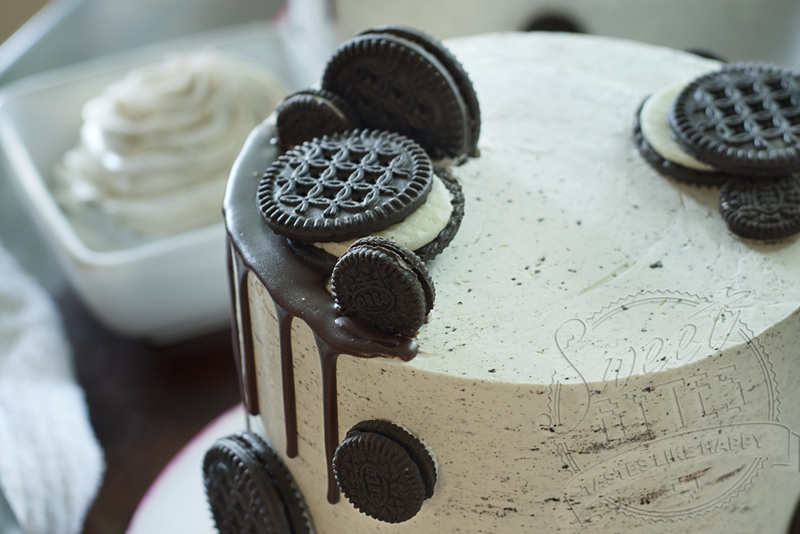 Frosting is used to cover the cake, decorate the cake, and fill the cake. Frosting can also be used on any dessert, not just cake. It’s usually spreadable and comes in any flavor you can imagine. I can’t speak for the “American-ness” of this buttercream, but I can explain what it is. American Buttercream is a fat (butter), mixed with powdered sugar, flavoring, and a little liquid to get the consistency right. Many recipes only use shortening and no butter. Still, many more will argue that if you are going to call it buttercream, it should have some butter. Personally, I am Team All Butter, All Day. If you must use shortening, a secret of professional bakers is Hi-Ratio Shortening which whips up light and fluffy without the greasy mouthfeel of grocery store shortening. It also contains trans-fat and whatever you think of that is between you and Jesus. Organic palm shortening, such as Spectrum Shortening is a great option. The amount of each ingredient and the mixing time of each ingredient are where people really start to divide. Secret recipes and methods start emerging and this is part of the fun. A well-developed frosting recipe is a legacy that can be passed to the next generation. My vanilla buttercream recipe is my very favorite tasting American buttercream. It pipes beautifully, is great for a filling or frosting and it can even be used under fondant. 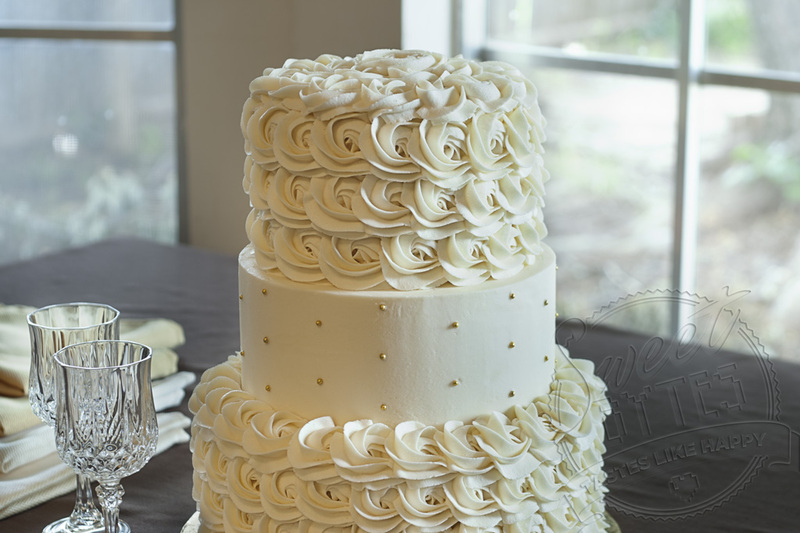 In fact, it’s the same buttercream I used to decorate the 3 tiered rosette cake in the photo above. ABC is suitable for a frosting, filling, or piped decorations. Flavors changed easily using extracts, purees, emulsions, powders, zests, juices, liqueurs, curds, etc. Sometimes, it can be gritty due to the powdered sugar. Mixing methods and sugar amounts and quality of powdered sugar have to be adjusted to reduce this unpleasant texture. If made with all butter, it could begin melting in a warmer setting such as outdoors or under a direct spotlight. Cream Cheese Frosting is very similar to American Buttercream with the exception of adding cream cheese. This is a very rich frosting and it pairs well with spiced cakes, fruit flavored cakes… and, well, if you love cream cheese, all desserts. Basically, to make cream cheese frosting you beat cream cheese, butter, powdered sugar, and vanilla to make a frosting. You can add milk or cream, or even more powdered sugar to change the consistency of the frosting for different applications, such as filling or piping. Recipes vary the cream cheese to butter ratio, the mixing methods, and the other ingredients amounts. Some even have tips and tricks to add to make the cream cheese frosting hold up to conditions it doesn’t favor, like piping or use under fondant. In general, I have found that cold cream cheese frosting, will do what you tell it. Warm cream cheese frosting is only good for pouring on bundts and cinnamon rolls… and eating by the spoonfuls. Here’s a link to my best-loved cream cheese frosting recipe. You should also try my Chocolate Cake Frosting which is a chocolate cream cheese frosting/ American buttercream hybrid. The flavor can be changed easily with extracts, powders, emulsions, liqueurs, etc. Cream Cheese Frosting holds up well as a filling or frosting. It can also be piped, but I would test your recipe’s limitations before making it the star of a big event. Easy Buttercream Frosting has been becoming more and more popular with famous names using it and touting that it has all of the deliciousness and none of the fuss of real Swiss Meringue Buttercream. I first heard of it while taking Mike McCarey’s Craftsy online class, Incredible Cut-Out Cakes. I couldn’t believe how simple it was to put together! Amazingly, it has the properties of more difficult Meringue Buttercream Frostings with zero fuss! The base recipe is pasteurized egg whites and powdered sugar whipped together for 5 minutes, then butter added a bit at a time, flavor as desired. How easy is that? Of course, everyone adds their own special secrets, but it’s still EASY! 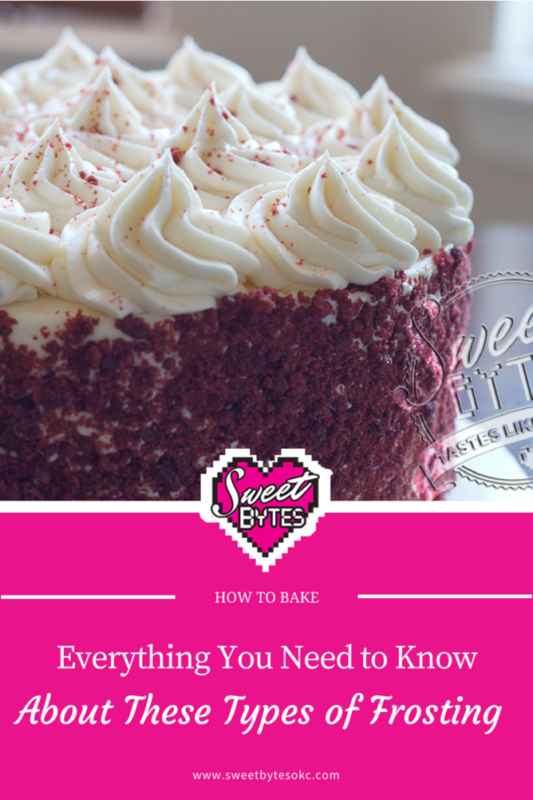 Liz Marek, Sugar Geek Show has also put together a wonderful tutorial and recipe on Easy Buttercream here. Flavors can be added easily using extracts, purees, emulsions, powders, zests, juices, liqueurs, etc. A stand mixer will make this job easier. This buttercream is pretty easy to make, like American Buttercream. It starts with a cooked flour, milk and sugar base (same as homemade pudding). This pudding is then cooled and later added to whipped butter with flavoring to make a delicious and very stable frosting. This is an old-fashioned frosting that pairs well with cakes like Red Velvet (it’s the original Red Velvet Cake frosting) and others where you would regularly see cream cheese frosting. It’s not as sweet as American buttercream, but it isn’t light and airy like meringue buttercreams. The great thing about Ermine Frosting is that it is more stable than American buttercream, but you don’t have to mess with eggs like the European versions. Flour Buttercream Recipe on Serious Eats is a good bet to get you started with Ermine Frosting and they ALWAYS do their homework so you get great recipes from them. This frosting is not as light or silky feeling as Italian or Swiss Buttercream. Again, no knowledge of the true country of origin, but the richness screams France to me. French Buttercream is made in a very similar way to Italian Meringue Buttercream, except with egg yolks. This style of buttercream is decadently rich and perfect for blowing people’s minds as a filling. The basic recipe involves heating sugar and water to 240°F and then pouring the sugar syrup over whipped egg yolks and adding butter and flavoring to make buttercream frosting. Serious Eats: Silky French Buttercream Without All the Fuss is a great recipe that makes sure your eggs are safe AND you won’t have to pour the molten sugar syrup into a moving mixer! Stella Parks always with the win-win! Flavor with extracts, curds, liqueurs, emulsions, purees, zests, powders, etc. Ganache is my love language. It is only 2 simple ingredients, but one of them is the food of the gods, Chocolate. Yes, ganache is only chocolate and cream, but it is so versatile and has so many applications from candy making to cake decorating that you need it in your repertoire. 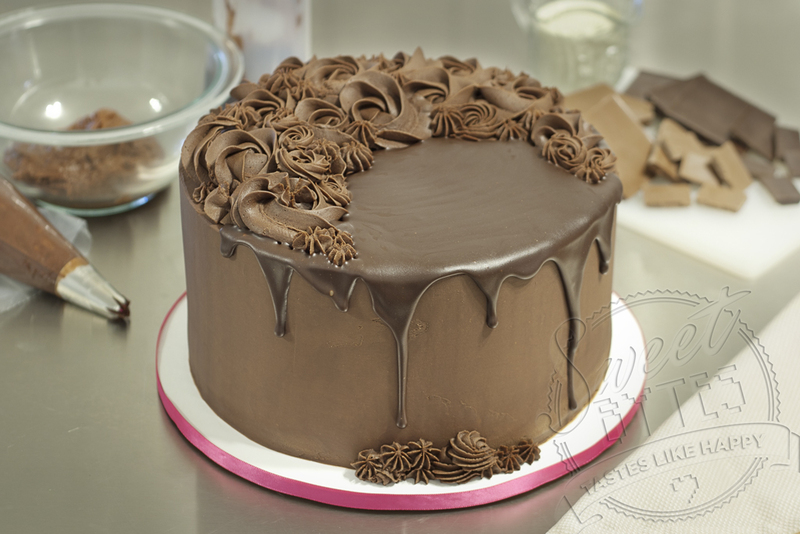 Ganache Frosting can be made with any type of chocolate, including white chocolate, and heavy whipping cream. The ratios of cream to chocolate vary depending on how you would like your ganache to set and what quality or type of chocolate you are using. Usually, I rely on my downloaded version of The Ganacherator to calculate how much chocolate and cream I will need for my cakes. It’s a great tool. Her calculations are set for a very firm setting ganache, great under fondant. The basic recipe is chop chocolate and set it in a bowl, pour almost boiling hot cream over the chocolate and allow to set for 5 minutes with a cover over the top. After the chocolate has had time to melt, slowly stir the cream and chocolate together until all chocolate bits are melted and cream is fully incorporated into the chocolate. This can also be done in the microwave. The ganache can be left warm for poured applications, used at room temp for spreading or whipped to make a fluffy frosting. Read more about ganache and get my recipe for ganache for a layer cake in my post, What is Ganache. It takes time for the ganache to reach the right temperature for frosting or piping and sometimes it can be finicky. German buttercream is becoming a well-loved favorite in some baking circles. I give credit to Stella Parks, author of BraveTart: Iconic American Desserts . It starts with a cooked custard base, which is then cooled. Softened butter is added along to make an amazing frosting that is not as sweet as American Buttercream Frosting, but not as buttery tasting as Swiss Meringue Buttercream. It is, however silky and light in the mouth like SMBC! Still can’t vouch for its country of origin… BUT it is made with the same ingredients as SMBC with a different order of operations. Italian Meringue Buttercream is the most stable between, Swiss, French and Italian. It can hold up to almost anything you can swing at it, but it will still melt in direct sunlight or heat. Because butter. IMBC is suitable for a frosting, filling, or decorations. It glides over cakes like a dream. IMBC can be used under fondant. Because it’s so stable, professional cake decorators prefer it or Swiss Meringue Buttercream for all of their cakes. It can be colored using AmeriColor Soft Gel Paste Colors . Keep at room temperature for several days. You have to have a candy thermometer or a very good understanding of the stages of sugar dissolving. Special equipment makes the job easier. A candy thermometer, stand mixer, and a double boiler really help. There is a danger of being splattered with hot sugar syrup when pouring it into a moving stand mixer. Learning how to make IMBC properly takes patience. You can break your buttercream by adding too much liquid. You might eat it all with a spoon before it gets onto the dessert. Some people (lovers of American Buttercream) think it tastes too much like butter. The main properties of this buttercream are that it is shiny and almost translucent. Creating beautiful piped flowers and a signature look that comes from the mixing method of this buttercream. From what I can tell, this is a meringue-based buttercream similar to Swiss and Italian Meringue types of frostings, but the method of mixing varies at the end. This buttercream is sort of new to me on the buttercream scene. I am not paying to take the official class offered by the patent holder of Glossy Buttercream at this time, so I am not privy to the insider tips and tricks. However, there are many versions of this shiny type of buttercream online. It’s hard to keep food secrets secret for long because the very nature of food is sharing and people are super resourceful. Here is the best explanation with a recipe I can find, it comes from a blog called Jemput Makan. You will need special equipment to pipe the flowers and make the buttercream properly. Seven Minute Frosting is an old-fashioned recipe dating back to the early 1900’s. It’s called Seven Minute Frosting because that’s approximately how long you will have to beat it to get it to make the signature stiff peaks. It’s also called Boiled Frosting because you beat it at the same time it is cooking on the stovetop over boiling water. It has a very fluffy, marshmallowy mouthfeel and light, sweet flavor. It pairs well with all types of cakes, especially very rich cakes like Devil’s Food. This frosting has very simple ingredients: Sugar, egg whites, cream of tartar, salt and vanilla. You place all of the ingredients in a good stainless steel pot, place it over a medium heat and start mixing it with a handheld mixer. In about 7 minutes you can add your flavored extracts and you should achieve your magical stiff peaks around the same time! It’s basically heaving whipping cream, powdered sugar, flavoring such as vanilla, and a stabilizer like gelatin or nonfat milk powder. Once stabilized, the whipped cream will hold up for at least 24 hours without liquifying or deflating. In my post, How to Make Whipped Cream At Home, there’s a great recipe for Stabilized Whipped Cream using non-fat milk powder. I did a test and it held it’s piped shape without deflating for 5 days! I also cannot speak for the Swiss-ness of this style of buttercream, but I will explain what it is. Swiss Meringue Buttercream is made with egg whites, sugar, butter and flavoring. Heat egg whites and sugar in a double boiler until the mixture is very warm and the sugar dissolves. You can even use pasteurized egg whites from a carton to avoid separating eggs. Whip the egg white mixture to stiff peaks. After the meringue cools, add butter in small chunks followed by flavoring. My favorite recipe calls for added powdered sugar, but purists will stick with only the sugar added in the beginning. (Again, this is where secret recipes are gold. Everyone has their tips and tricks that make their recipe special.) This type of buttercream is more stable in humidity and heat than American buttercream, but it will still melt in hot temps (just like any butter would.) You can sub some of the butter for shortening if you must have heat protection. You can get 7 day FREE trial on Bluprint and also watch the free Modern Buttercream class and ALL of the other classes on fondant, buttercream, baking, sewing, etc.! Swiss Meringue is suitable for a frosting, filling, or decorations. Very nice for piping and can hold ruffles, borders, flowers, etc. Flavor easily using extracts, purees, emulsions, powders, zests, juices, liqueurs, etc. You have to heat the egg whites and dissolve sugar. This takes patience. Meringue buttercreams have a learning curve. Special equipment makes the job easier. A Candy Thermometer , stand mixer, and a double boiler really help. It is more time consuming to make a meringue buttercream than American Buttercream. Did I leave your favorite types of frosting out? If so, drop me a line or comment below! I also am excited to hear what are your favorite types of frosting and frosting pairings. Mine is milk chocolate ganache with peanut butter buttercream and CHOCOLATE CAKE! I get a little drooly just typing about it.